The scene on the Margate beach on Saturday May 26, 2018, Memorial Day Weekend. 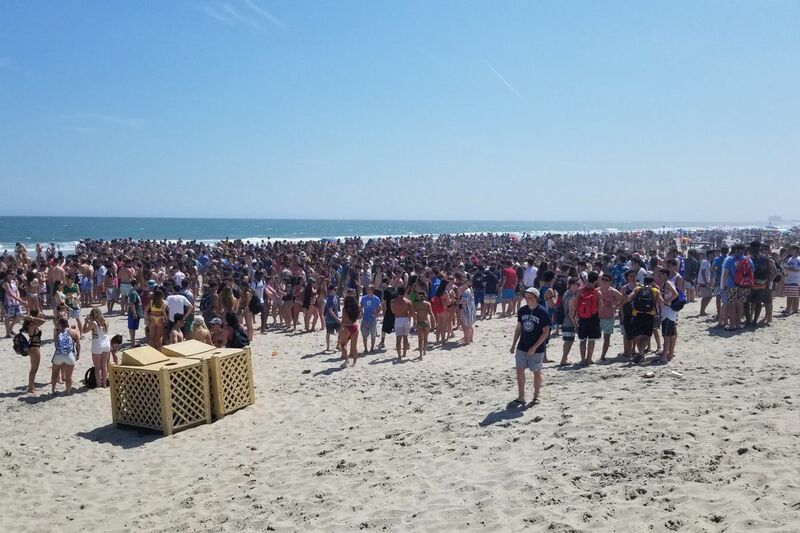 MARGATE, N.J. — Police in this busy Shore town say that as usual, more than a thousand visiting teenagers crowded onto the beach near Lucy the Elephant over Memorial Day weekend, but, unlike last year, when fights and loitering outside the nearby Wawa store spiraled out of control, no serious incidents were reported. "No fighting," said Police Capt. Ken Bergeron. "It was packed. The beach was taken up. They were just standing around. It is the holiday weekend." Bergeron said Margate deployed eight police officers to the beach to keep a lid on the teens. He said there were 13 overall arrests over the weekend, including one for possession of cocaine in a park near the beach and another for driving while intoxicated. There were four arrests for underage drinking, in addition to about 30 summonses for violations of ordinances, including open containers, drinking in public, and urinating in public. Bergeron noted that the beach is "much bigger" than last year, due to sand replenishment, which let the crowds spread out more. He said the teens, many of whom were carrying backpacks but no beach chairs, were mainly from Philadelphia and its suburbs. "Most locals don't go to that beach," he said. Although he said police assume most of the teens are carrying alcohol in their backpacks, they cannot be searched without cause, he noted. Last year, a video of teens fighting on the beach went viral, but the viral video distinction of Memorial Day weekend at the Jersey Shore this year belonged to Wildwood, where a 20-year-old Philadelphia woman was punched twice by police during an altercation. On Wednesday, authorities in Cape May County released police body camera footage from that incident: Three videos that show a sometimes violent confrontation between three Wildwood police officers and the woman. In Margate, Bergeron said that Wawa hired its own security force to patrol outside its store on Washington Avenue and that Margate bicycle and other police made regular rounds. Line in the Margate Wawa longer than lines in Disney. Was just told it’s a 45 minutes wait from my spot in line. Should have gotten a FastPass. "Security kept them moving," he said. "It was a good weekend. The town was crowded, but we had no major incidents."